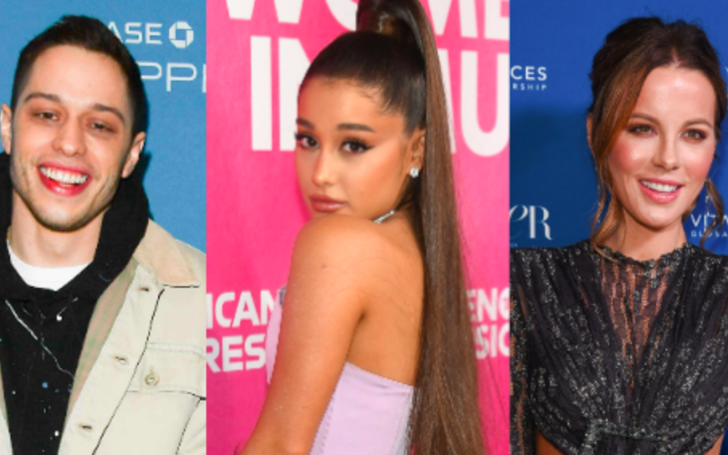 US mainstream singer Ariana Grande gives a positive response to the rumored romance between her ex-boyfriend Pete Davidson and his 20 years elder girlfriend Kate Beckinsale. Following his split from singer Ariana Grande, the SNL's comedian cast member Pete Davidson is reportedly dating British actress Kate Beckinsale. And unlike the other celebrities who prefer to stay silent when asked about their exes new romance life, Pete's former fiancee, musician Grande proudly responds with no hesitation. Ariana who broke off her engagement with Davidson in October last year still gets confronted by the topics that are related with Pete. On Wednesday, one of the TMZ reporters asked the singer as she emerged into One Radio Networks in Westwood, California. The 25 years old artist who seemed a little disturbed by her misspelled Japanese tattoos just a few days earlier responded without hesitation and being bothered. The 2019 Grammy nominee's romance with Pete faded away after less than five months of dating, both realizing that their engagement was too soon for their relationship. Since her last split with Davidson, Ariana who appears to be focusing on releasing her new album thank u, next confirmed to her fans last month that she retired from dating life and intends to date no one at the moment. On the other hand, Pete, currently busy filming with Judd Apatow, and his current love partner Kate first sparked their dating rumors when the two were spotted flirting at the Golden Globes Awards after party. Moreover, Kate Beckinsale too appears to be pleased with dating someone younger than her.